Javid, Hassan 2011. Class, Power, and Patronage: Landowners and Politics in Punjab. History and Anthropology, Vol. 22, Issue. 3, p. 337. Dorn, A. Walter and Gucciardi, Stephen 2011. THE SWORD AND THE TURBAN: ARMED FORCE IN SIKH THOUGHT. Journal of Military Ethics, Vol. 10, Issue. 1, p. 52. Roy, Anjali Gera 2011. Celebrating ‘the sons of Jats’: the return of tribes in the global village. South Asian Diaspora, Vol. 3, Issue. 1, p. 89. Peers, Douglas M. 2011. The Encyclopedia of War. Barrier, N. G. 2006. Trauma and memory within the Sikh diaspora: Internet dialogue. Sikh Formations, Vol. 2, Issue. 1, p. 33. Sen, Satadru 2004. Contexts, Representation and the Colonized Convict: Maulana Thanesari in the Andaman Islands. Crime, Histoire & Sociétés, Vol. 8, Issue. 2, p. 117. McLeod, Hew 1999. Sikhs and Muslims in the Punjab. South Asia: Journal of South Asian Studies, Vol. 22, Issue. sup001, p. 155. Bayly, C.A. 1998. The first age of global imperialism, c. 1760–1830. The Journal of Imperial and Commonwealth History, Vol. 26, Issue. 2, p. 28. More important than wars and battles were the administrative arrangements made by the Turko-Afghan rulers which had a more lasting effect on the lives of the people. The Lodhi Sultans, acknowledged the fictional authority of the Abbasid Caliphs by styling themselves as their deputies. The cities and towns of the Punjab, as elsewhere in northern India, served as the centres not only of administration but also of Muslim culture. Imported by the immigrant Muslims, ideological differences were perpetuated by those who came under their influence in India. It is easy to identify three old sects: the Sunni, the Shia and the Ismaili. In Indian sūfī literature emphasis is laid on repentance, renunciation and satisfaction with whatever is ordained by God. Even in towns founded by Turkish or Afghan administrators the proportion of Hindus was very considerable. For a really lower-class movement we have to look to the Sants of northern India. They were deeply influenced by the Vaishnava bhakti movement. Guru Nanak was thoroughly familiar with the politico-administrative arrangements made by the Afghan rulers, particularly in the Punjab. Guru Nanak invites people to come out of the shells of their castes as individuals to tread the path of truth; he encourages the lowest of the low to feel confident of his spiritual regeneration. Guru Nanak's attitude towards the traditional Hindu deities and scriptures is intimately linked up with his attitude towards the pandit. Guru Nanak gives as much attention to the jogi as to the pandit, and he is equally familiar with the beliefs and practices of both. God, for Guru Nanak, is the eternally unchanging Formless One. He has no material sign; He is inscrutable; He is beyond the reach of human intellect. In the process of man's union with God, an important experience is visamdd, the awe-inspiring vision of God's greatness and the feeling of ecstasy resulting from it. The position of the Sikh Panth at the end of Jalaluddin Muhammad Akbar's reign may be seen as the culmination of a peaceful evolution of nearly three-quarters of a century. Akbar's conquests, his concessions and measures on conciliation resulted in peace and security in his vast dominions, particularly during the second half of his reign. Akbar's reign was covered by the pontificates of three of the first four successors of Guru Nanak. These three were Guru Amar Das, Guru Ram Das and Guru Arjan. The number of Sikhs increased considerably in the time of Guru Amar Das. Guru Ram Das advises his followers not to retaliate, but to leave things to God. The dīwāns of God, the Sikhs, need not be afraid of the earthly dlwdns, the administrators of the empire. The religious ideology of Guru Nanak was reinforced by his successors in a manner that added new dimensions without minimizing the importance of his basic ideas. Interference by the Mughal emperors Jahangir, Shah Jahan and Aurangzeb in the affairs of the Sikh Panth was an important feature of the seventeenth century period. In the Sikh tradition, however, there is hardly any reference to Jahangir's order of capital punishment. Guru Hargobind's interest in hunting brought him into conflict with the Mughal administrators of the province of Lahore in the reign of Shah Jahan who had ascended the throne after Jahangir's death in 1627. The reign of Aurangzeb from 1658 to 1707 was marked by some important changes, making the context of the late seventeenth century rather different from that of the late sixteenth century when Akbar was on the throne. Faced with threat from outside and dissension within the Sikh Panth, Guru Gobind Singh thought long and deeply about his own position as the successor of Guru Nanak. The success of Guru Gobind Singh encouraged more and more of the Singhs to come to Anandpur. The eighteenth century in Indian history is known for the decline of the Mughal empire and the rise of successor states and new powers like the Marathas and the British. The rise of the Singhs into power during the eighteenth century was a part of this political process. Nadir Shah took over Qandahar from the Afghans in 1738, and also occupied the Mughal province of Kabul. In 1739, he entered the province of Lahore and defeated its Mughal governor, Zakariya Khan. The period from Banda Bahadur's death to Nadir Shah's invasion assumes great significance. One of the important developments of this phase was the emergence of Ramdaspur as the rallying centre of the Singhs. The Singhs were not the only new rulers of the Punjab. The Singhs constituted the bulk of the ruling class in the areas under Sikh rule. The majority of the rulers were Jat, but there were also others who had earlier belonged to the lower castes. The occupation of Lahore by Ranjit Singh in 1799 marked a watershed in his career and in the history of Sikh rule in the Punjab. With the conquest of Lahore, Ranjit Singh was fairly launched on a career of systematic aggrandisement which made him the master of an empire in less than a quarter of a century. By the Treaty of Amritsar, the British recognized Ranjit Singh as the sole sovereign ruler of the Punjab. The real strength of Ranjit Singh's army lay in its infantry and artillery. The revival of cultivation and trade, which had begun in the late eighteenth century, reached a high watermark in the reign of Ranjit Singh. Increase in agricultural production was paralleled by an increase in manufacturing and the volume of trade. The share of the Sikhs in revenue-free grants given by Ranjit Singh was the largest. New representatives of Sehajdhārī Sikhism were arising towards the close of Sikh rule in the Punjab. The colonial rulers introduced a large measure of bureaucracy and the rule of law, which established a new kind of relationship between the individual and the state. To increase agricultural production and revenue from land the British administrators of the Punjab introduced reform in the agrarian system with periodic settlements and records of rights as its major planks. The British policy of maintaining balance between the various communities encouraged competition between them. Communal consciousness was not confined to the Aryas or the Hindus. The Sikh peasantry suffered economically in the late nineteenth century with the rising tide of indebtedness but much less than others. The first reformer to emphasize the importance of Singh identity under colonial rule was Baba Ram Singh. One great resentment which Baba Ram Singh developed against the British was over the killing of kine for beef. Like most of the educated Punjabis, the Singh reformers tried to promote their interests through journalism. The phase of about three decades from the end of the First World War to the Act of Independence in 1947 was marked by political activity appearing first in the form of the Act of 1935 and then in the form of independence and partition. The Sikhs participated in the struggle for freedom in all its forms. The Shiromani Gurdwara Prabandhak Committee and the Shiromani Akali Dal started what a contemporary called "the third Sikh war", a non-violent struggle against the government for the control of gurdwāras. All the Akalis did not appreciate passive resistance or non-violence as the political weapon to fight against the colonial rulers. Sikh participation in the Legislative Council of the Punjab was only a little more satisfactory. After the formation of the ministry in 1937 the first important political development was Sikandar Hayat Khan's agreement with Jinnah at Lucknow in 1937. The Sikandar-Jinnah agreement brought the Akalis and the Congress leaders closer to one another. To the task of framing a constitution for free India was added the problem of resettlement and rehabilitation almost immediately upon Independence. The Constituent Assembly had been also eager to consider the issue of statutory reservations for religious minorities before August, 1947, but after the creation of Pakistan it favoured the abolition of all such reservations. The Akalis had taken interest in the affairs of the Sikh states and had considerable influence in their politics. After Independence, the leaders of the Akalis and the Praja Mandal revealed their differences first on the question of merger. Whereas the Akali leaders favoured a union of Sikh states, or even the creation of two new states by keeping Patiala as a single unit, the Praja Mandal leaders advocated merger of the princely states with the East Punjab. The freedom gained by the Akalis to shout slogans in favour of the Punjabi Province did not impress the States Reorganization Commission. The new Punjab state created new problems because of the way in which it was formed. Sant Fateh Singh expressed his dissatisfaction several months before the new state was inaugurated: genuinely Punjabi-speaking areas were being left out of the new state and given to Haryana or Himachal Pradesh; Chandigarh was unjustly being turned into a Union Territory; power and irrigation projects were being taken over by the Union Government. In 972, the general elections were held in the Punjab after the war with Pakistan resulted in the independence of Bangladesh and the prestige of Indira Gandhi was at its highest. In spite of political instability, the first five years of the new Punjab state were marked by a spurt in economic growth. When the Akalis declared in 1967 that they would make the Punjab 'a model province', 'an object of envy' for the rest of the country, the green revolution had already begun. 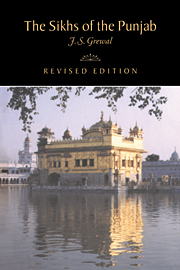 This bibliographical essay presents historical writing and major categories of source materials on the periods of Sikh history, such as Turko-Afghan rule, the Mughal Empire and its disintegration, and British rule and independence. The social situation in the Punjab in particular and in northern India in general during the late fifteenth and the early sixteenth centuries was marked by a great change due to circumstances brought about by the Turko-Afghan rule in the sphere of politics and administration, urban and rural economy, and the sphere of religious and secular culture. For nearly a century now the Sikhs had been nurtured in the belief that Guruship was confined to the family of Guru Ram Das. This is explicitly stated not only in the Bachittar Nātak towards the end of the seventeenth century but also at the beginning in the vārs of Bhai Gurdas.